Here’s a photo I took during my first ever train ride. The awesome curved window was in an abandoned train depot, next to a very uninteresting box building that currently serves as Grand Junction’s depot. For our 30th wedding anniversary Rick and I took a train to Reno, complete with a sleeper. From there, we rented a car and *quickly* got out of Reno to see the more natural sights in the Sierra Nevadas. Read Zephyr by Henry Kisor. See if his cross country train ride resembles your experience! Just got Zephyr from the library and am about one-third of the way through it. So far, I’d say he’s right on! He started with a behind-the-scene peek, being allowed to watch the prep work at the train yard in Chicago, which I found fascinating. The book was published in 1991, but like riding the train, not a lot seems to have changed. Being on a train is like being in a time warp. It’s a step back in time. The experience forces you to slow down. There’s really no other choice. One big difference from the book is they no longer show movies. There’s not much ‘input’ from the modern world, no sensory overload. There was sporatic cell phone service; even then you didn’t see people using cell phones. Our experience is probably different than riding in the coach. 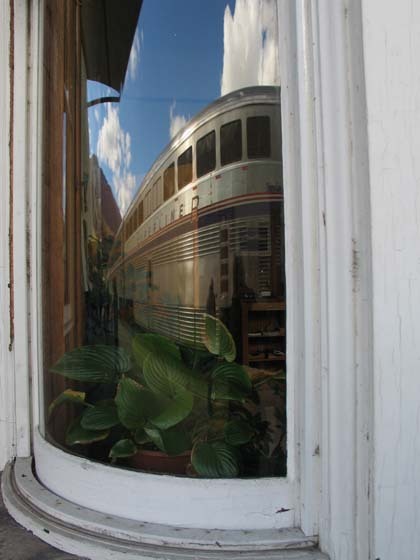 We were in a roomette in a sleeper car, complete with a large picture window. The only time we came across people seated in coach was in the lounge, the observation car or the dining car. The various cars on the train are hooked up so that coach passengers don’t have free access to the sleeper cars. Not many coach passengers ate in the dining car, most likely for econimical reasons (although the prices were very fair). The lounge sells sandwiches, chips, donuts and the like. The dining car offers full meals, which was included in our roomette price. Standard procedure, Rick and I were seated side by side in the dining car, leaving the seats across the table available for other passengers. It was interesting to talk to other people, the first question usually about ‘why’ are you on the train. For most, it was simply the experience. This will not be my last train ride! I loved it!